The Rollercoaster Shape Sorter combines shape sorting and bead coasting activities into a single toy. 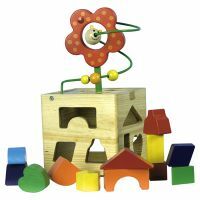 Children are challenged to use problem-solving skills by matching colorful shapes with the matching holes in the block. Counting skills are strengthened as kids move beads along the top portion of the toy. So let your child develop their hand-eye coordination while participating in entertaining play with the Rollercoaster Shape Sorter! Ages 3+.